This new generation system offers precise and accurate monitoring of process temperatures at a working point on a PCB when soldering with lead free alloys. 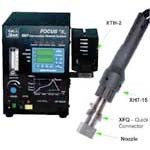 Also, allows for pre-setting of exact temperature of air stream at the end of a Hot Air Tool, Hot Air Pencil Nozzles and at a tip of a Soldering Iron. Board Holder with X and Y micrometer adjustments and precision rotation stage allow for fine alignment of a component with the corresponding land pattern on the board. Full Convection, Bench Top, Batch oven with Nitrogen Connections. 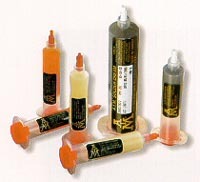 Especially designed for lead free soldering. High performance, inexpensive reflow batch oven for use in small lot production and laboratory simulation tests. 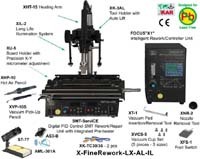 Developed for Lead-free Temperature Controlled Soldering Super Station. Extra long life, fast recovery time, lead-free soldering iron with built-in high output heater (72W). AIM (American Iron Products) is the leader in Lead Free Soldering Alloys and Fluxes. Flux Paste NC-254 is the necessity in rework of all SMD components and especially BGA's and CSP's.